It has become a kind of tradition to release the ‘local’ version of “Hits!” compilation when Roxette do more than few concerts in one country. After South African, German and Australian edition – it’s a high time for Canada. 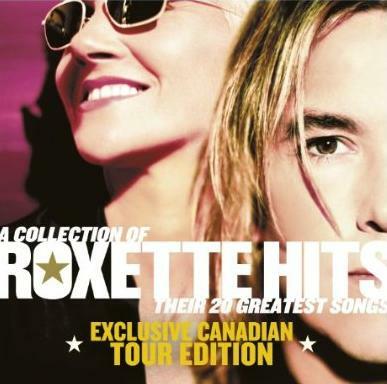 According to Amazon.de the album will be out one week before Roxette’s very first North American concert in Ottawa on August 29. The updated tracklist published by Archabault.ca includes two different songs – “She’s Got Nothing On (But The Radio)” replaced “Reveal” & “The Sweet Hello, The Sad Goodbye” came in for “Milk & Toast & Honey”. 10. How Do You Do! Thanks to Daniel Kühn & roxqc for sharing this news. Thanks for finding this out. Quite odd tracklist. I’d replace the horrid One Wish instead (is it one of their 20 greatest songs? I don’t think so). Or A Thing About You. Actually, Milk & Toast & Honey was a bigger hit than ATAY. I guess it has to do with CD time limitation. One wish is the shortest track and it’s essential for it to stay in the tracklist so that the total number of songs can remain 20. Personally I don’t like it either. I wonder if they put the original version of sweet hello or the new one. I love the remix, but it would be odd to place it among the other songs. Come to think of it, it sounds totally different from the Travelling sound as well. I guess it’s a good thing it wasn’t ready for the album after all. Interesting they tweaked the tracklist. Bummer that it doesn’t include the DVD like the other tour editions. Interestingly, “The Sweet Hello” is the Bassflow Remake Edit.